Reduce Heat Loss, Eliminate Draughts, Lower Noise. It's getting colder but why spend ££££ on secondary glazing when you can do the job yourself at low cost? The Easyfix double glazing system is a secondary system that can be fitted internally or externally by any DIY enthusiast, quickly and efficiently, with the minimum of tools. The many benefits include, cutting fuel costs by reducing heat loss, eliminating draughts and lowering noise penetration. The Easyfix system is based on a small flexible edging strip that is placed onto the edge of the acrylic/plastic sheeting. The corners are easily formed using the mitre gauge, a feature unique to the Easyfix system, which gives a neat and accurate finish. 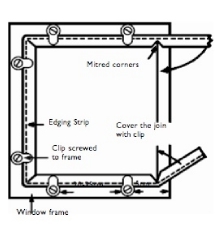 The sheet is presented to the window frame and secured by nylon fixing clips and woodscrews. P.v.c chanelling suitable for 3mm or 4mm plastic/perspex available clear and white, nylon fixing clips that are available in natural, fixing screws, a mitre block for perfect corner cuts on the chanelling and finally easy to follow instructions. Just a few simple tools are required when fitting this DIY secondary glazing kit, a screwdriver, craft knife, marker pen and a tape measure is really all you need. Before you purchase your acrylic measure your window so that it overlaps your existing frame by at least 10mm on all sides. Your cheap answer to secondary glazing. Reduce fuel bills, reduce heat loss, eliminate draughts and lower noise penetration. This DIY secondary glazing kit includes all you need to complete a professional job. Simply fit the pvc channeling around your acrylic, place the acrylic against your window surround and secure using the nylon fixing clips and screws.